Most critics agree that Darren Aronofsky’s 2017 film mother! operates as some sort of allegory. There are a few different allegories to choose from, including the biblical narrative of creation, fall, and sacrifice; the act of artistic (or even cinematic) creation as consuming and oblivious; and the depletion of natural resources by human cultures. The winding plot of mother! will not be recounted here, since it both relies on the element of surprise and is so baroque that it would take the larger part of this review just to present it. At its core, the film depicts a woman experiencing a set of increasingly dramatic trials involving her house, her husband, and her newborn child, most of which seem entirely inexplicable except within the schema of an allegory or extended metaphor. The idea of a film as a representation of other, different events is not unique to mother! After all, “reading” a film through a psychoanalytic, feminist, Marxist, or (more recently) queer lens has been an accepted approach in academia for decades. Yet there is a difference in methodology between those readings and the reception of mother! Only the staunchest proponents of theoretical positions would argue that a film they are writing about cannot be experienced without their ideological frame. 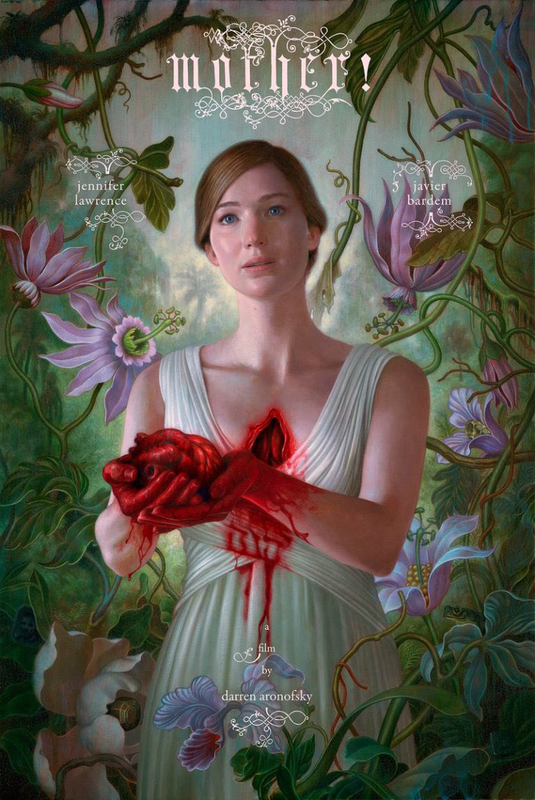 With mother!, however, there seems to be a consensus that experiencing the film outside of an allegorical understanding would be missing what the film is “about.” No review of the film would be complete without at least a mention of these allegories, and most reviews place them front and center, Alissa Wilkinson writing that “Mother! has a clear central metaphor drawn partly from the Bible” and A.O. Scott writing that “it plants its flag defiantly on the wind-swept peak of religious (and ecological) allegory.”1 I will not argue whether or not mother! should or should not be considered primarily as an allegory. Rather, I will offer some considerations of how an allegorical reading may shape the viewing experience, arguing that treating a film as an allegory dramatically affects the way we interpret that film. I will first develop this argument and then refer to an aspect of mother! that is often neglected because of the film’s status as an allegory. Foreknowledge of a film’s classification deeply affects viewing conditions. If viewers know in advance that a film is “meant” to be an allegory, they will be constantly trying to decipher that allegory. A single aspect of a film can thus easily become its identity. Instead of interpreting the film using the language of possibility, a declarative statement is made and the film becomes condensed in a single equation. Following an allegory through a film becomes an act of detective work, where every event must fit into the allegorical frame. The relatively few events that do not easily conform to the allegories of mother! have caused much debate,2 while those that seem clear are rarely given a second thought. The desire for the proper fit of narrative events into preexisting structures causes less attention to be paid to events within the movie, as well as formal elements. The allegory sets up a clear goal for each event (or character): the connection between the event and an element within the allegorical schema. The fulfillment of this goal oftentimes becomes synonymous with the fulfillment of a narrative event as such. That is, if a narrative event is successfully connected to some piece of allegorical content, it has served its purpose and the viewer is free to move on to the next. For instance, Michelle Pfeifer’s character in the film (simply called woman) is a provocative, invasive figure. Once the viewer makes a connection between her and the biblical character of Eve, they have solved the case, and no longer have to mull over her enigmatic qualities. This one-to-one puzzle-like structure divides a film up into pieces, and then limits how those pieces are experienced. Rather than wondering at an event and relating it to the work as a whole, the practice becomes placing it as quickly as possible. The pleasure of such an activity is also similar to a puzzle. There is a drive to progress from chaos to order through the gradual placement of pieces into an eventual whole. What this system leaves out is the particularity of the work, since the fulfillment of each piece of the work is found in its resemblance to something else. The more wholly one work resembles another work, the more satisfying the allegorical activity. By searching for allegorical pieces, the viewer hopes to find a conforming of one work to the image of another. This is not to say that allegory is a poor form. What makes allegory meaningful is the sustained and rich overlapping of one image, idea, or situation onto another. This is not done simply for the pleasure involved in the process but to somehow illuminate one or both of the elements involved. The trouble with mother! is that its status as an allegory film in many cases has blocked out the opportunity for more sustained and thoughtful interactions with it, thus preventing it from acting as an effective allegory. This might say more about our critical and cultural environment than about the film itself. There are features of mother! that warrant further investigation outside the realm of allegory. However, these have not been treated as such, because of the film’s identity as an extended metaphor so solidified by review headlines. One of these features is the film’s presentation of sensation, which is a development from Aronofsky’s previous works. The tearing of flesh was central to the director’s film The Wrestler (2008), and the heightening of certain senses has been prevalent since Pi (1998). In mother! it is the sound design that works to bring out every bit of contact between substances. Everything in the film’s world is permeable and there is inevitable damage through movement and touch. Jennifer Lawrence’s character seems to be acutely aware of this, wearing no shoes or even socks for the film’s runtime, as if trying to avoid bruising the substances around her. This highlights the essential fragility of the order we try to create for our lives, the precarious position of objects in relation to one another. The sonic world of mother! sears and tears, becoming a relentless throbbing that reminds us of our bodies and the way things that have their source outside our selves can permeate our physical structures. The fragility of the body here works against the common presentation of violence in popular film, which is increasingly brutal in an attempt to impact the viewer. This brutality ironically also leads to bodies being more and more impervious to violence.3 Instead of bodies thrown and bashed without effect, mother! treats them as always ready to bruise, and even fall apart. In addition to the violence of the soundtrack, there are rhythms whose consistency and beat seem to defy daily life. For instance, in the scene in which mother makes breakfast for Him (Javier Bardem) and man (Ed Harris), line readings and other sounds fall into a steady pulse, as if each has dutifully practiced its entrance. Here are the major sounds and dialogue from a portion of the scene: *toilet flush*-“morning”-“morning”-“how did you sleep?”-“like a baby!”-*laugh*-“really vivid dreams, must be the air”-*chair being moved across floor*-“well, I’m confused”-*doorbell*-“who’s that?”-“I’ll get it”-“no don’t, I’ll get it.” Each of these staccato sounds is placed on the heels of the previous one, forming an incessant and non-realistic sense of clockwork sequencing. The effect is off-putting, since the constructed sense of rhythm is not hidden at all. This Brechtian approach functions both within and beyond the scene itself, as it encourages the viewer to suspect the collusion of the two male characters and question the reality of the entire situation. Perhaps this review is simply a reminder that our preconceptions of a text’s structure inevitably shape what we are able to receive from it. I hope that mother! will eventually be examined more thoroughly in light of its multifaceted identity. Analyses addressing the relationship between sound and image, the viewer’s bodily affect, and the gender politics of the film’s cyclical trajectory would be steps toward a fuller exploration.